There has been a recent upswing in promoting a “culture of safety” in academic chemistry departments and labs across the country.1,2 Industry labs have been heralding this as a much needed training element for chemistry students and are happily hiring graduates of the most progressive departments. It’s not as though chemistry departments didn’t care about or were ignoring safety before this (we couldn’t, of course), but this new energy puts safety front-and-center every day. A couple years ago, my department at the University of Minnesota initiated a simple but effective way to promote safety: before each and every seminar or group meeting, the seminar host or presenter starts by presenting a short “safety moment.” The topics of these safety moments vary from specific instructions about how to handle a particular chemical compound to the general practices of safely operating commonplace laboratory equipment like centrifuges.3 Presenting safety moments is a way to make sure that the importance of safety is not just a theoretical priority in our department, but is something that we actually discuss in practical terms on a regular basis. 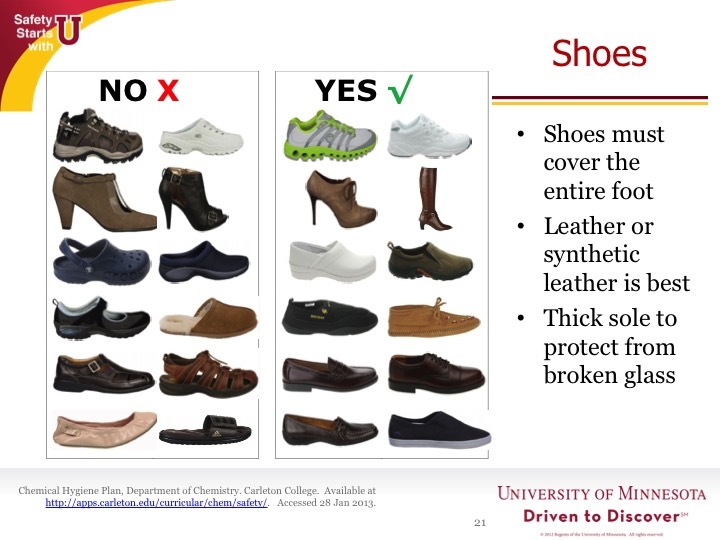 In the Center for Sustainable Nanotechnology, student knowledge of best practice safety procedures is as critical as in any chemistry research setting, and we were considering adding safety moments to all our videoconference calls and in-person meetings to emphasize the importance of safety as a cultural standard within the Center. During a discussion about this over the summer, three center members (Rigoberto Hernandez, Miriam Krause, and I) came up with an expanded version of the safety moment that we call “DISC moments.” I love this idea and I hope it spreads the way safety moments have. In our variation, rather than presenting just about safety, we rotate our one minute presentations on “DISC” themes, where DISC stands for Diversity, Innovation, Safety, and Communication. All four of these are core concepts that drive the Center’s work, and by devoting explicit attention to each one at our meetings we hope to promote awareness, encourage discussions, and make these themes more than just abstract concepts for our Center members. 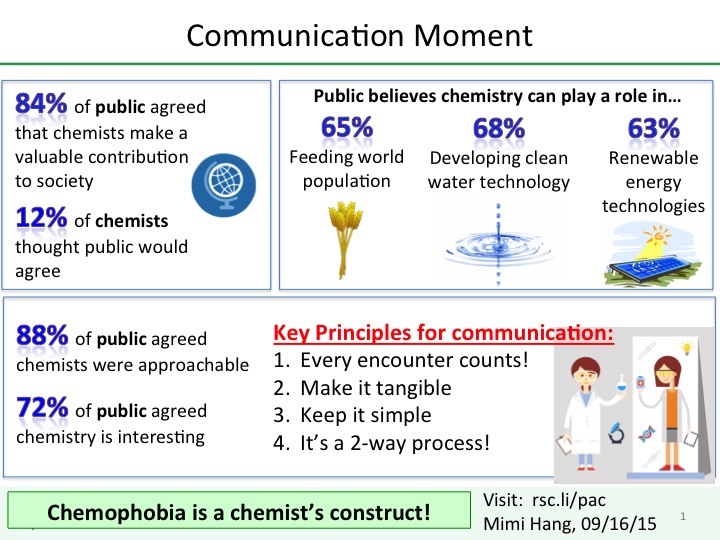 An example “communication moment” delivered by CSN graduate student Mimi Hang as part of the DISC moment practice. These short presentations emphasize the Center’s values and catalyze important awareness and discussion on these topics. Our intent is to build up a shareable database of “moments” in each topic so that future Center members and others outside our Center can benefit from this activity. There are still kinks to work out in this new practice of presenting DISC moments – sometimes people forget where we are in the DISC rotation so they don’t know which topic to present, sometimes people spend much more than one minute on the concept they want to share, and sometimes chemists have to work hard to come up with a topic related to diversity, innovation, or communication. For me, this last complication is exactly the reason to pursue the DISC moment practice. I am confident that, with thoughtful attention to best practices in diversity, innovation, safety, and communication, our Center members will do better, more impactful science both during their time in the Center and when they move on to the next big thing in their lives. Shreeve, J. Food For Thought On Chemical Safety. Chemical & Engineering News, 2015, 93(43), 44-45. Joint Safety Team home page, 2015. Tate, R. Google couldn’t kill 20% time even if it wanted to. Wired, Aug 21, 2015. Ceci, C. Don’t let chemophobia-phobia poison our communications. Scientific American, Aug 18, 2015. Safety should always be the number one concern, especially when conducting research in uncharted areas.